Finding the right travel luggage is not the easiest thing to do. You have many options, going from softside to hardside suitcases, from backpacks to duffle bags... But what exactly do you need to take into account? In this article you can find 5 tips to make the best decision for your next vacation. It all comes down to choosing the right material, size, features and make the right choices when it comes to ergonomy and durability. You maybe find it hard to choose between softside and hardside. The best tip is to take two things into account: the duration of your trip and the weather conditions. If you decide to go for a weekend getaway, you may choose softside over hardside, simply because you can take more belongings with you. A soft-sided suitcase is more flexible, and allows you to squeeze more products together in your suitcase. When you plan to go on vacation by plane for several days, you may choose a hard side suitcase over a soft side. Why? Hardside spinners are more rigid than their softside counterparts and will protect your fragile belongings more safely. You can lock your case with a combi lock with TSA, by this you avoid that people or objects cut open the fabric on the conveyor belt. A softside spinner however is worth considering when you don’t want to have scratches: you can simply wash out spots with a mild soap. The weather conditions at your destination are also worth considering. Here, a hard side suitcase is the winner. When you carry a suitcase with a hard shell, you never need to worry about the weather as this suitcase is water and -mostly- windproof. This suitcase only weighs 1.7 kg, which gives you the opportunity to pack more goods. Even when the suitcase is completely filled, it is still easy to carry. Cosmolite comes in 4 sizes and are fully stackable: 55cm, 69cm, 75cm and 86 cm. This casual duffle comes with and without wheels! You can choose to just carry it as a bag or use it as a suitcase. Moreover, the suitcase has a removable shoulder strap, sternum straps and smooth gliding zipper pullers to ensure comfortable carrying. 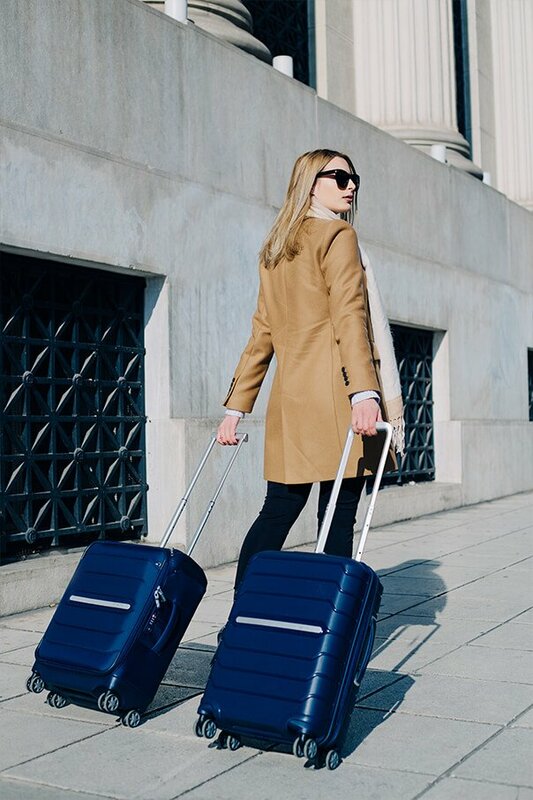 This suitcase does not only come in vibrant colours, it also has an ultra-lightweight construction and stageless wheel handles. It is available in 55cm, 63cm, 71cm, 78cm and 83cm. Tip: if you carry one of your Samsonite backpacks with you, use the smart sleeve at the back to slide it over the pullhandle of your suitcase. Some new smart features have entered the world of traveling and are worth considering as they increase your travel comfort. Moreover, you do not need to buy them separately, as they are integrated in your suitcase. Your devices unevitably run out of battery some time during your trip. Better safe than sorry! Your suitcase is ultimately convenient if it already has a power bank included together with a charging cable. No more being afraid of losing your suitcase: this smart device tracks your suitcase wherever you are. These trackers combine bluetooth technology when you are near to your luggage. An integrated USB port is ideal if you want to charge something outside of your suitcase. You can simply put your tablet in your suitcase and quickly charge your smartphone while you’re on the go. Make the right choice between durability and beauty. It’s not bad to let your suitcase show the wear and tear of your journeys. But what’s the most durable suitcase? One solution: aluminium. Samsonite offers a complete range of Lite-Box aluminium cabin and check-in suitcases.